This entry was posted in Uncategorized on February 27, 2012 by Andrea. I’m glad to see you know who has stopped touting himself as a shaktipat conferring guru and become excellent at a job he’s really cut out for and loves. That’s how you serve the world. If someone can in fact transmit shaktipat to you, they are not likely to talk about it, nor charge you initiation fees at workshops. But if it uplifts you to go thru the motions, by all means keep flocking to these marketers. This entry was posted in Uncategorized on February 26, 2012 by Andrea. There is an entire world of suffering that goes away when you stop expecting people to treat you fairly, or return a favor, or simply be courteous and respectful or return a call, do the right thing, etc. And when you are no longer attached to that, amazingly you begin to be treated better. Expect it. Never compare your journey with someone else’s. Your journey is your journey and not a competition. This includes the one-upsmanship that goes on when someone tells a story of awakening or paranormal event. There’s always someone who has to top the story. I’ve gotten to where I don’t care about the story. I care about their reaction to what happened, what did it stir in them, what realizations did it make them come to? I never want to hear, “oh I saw this” or “I saw that” unless someone is asking what it means. I want to hear what transformation took place in you, what is different NOW than BEFORE? Contrary to what you may have heard, the pentagram symbol is not a sign of “the devil” but is used by a large number of people who share a common belief in the sanctity of life. They don’t sacrifice living things for any reason. They do not worship the Christian Satan, nor do they revere any similar figure; most do not even recognize the existence of Satan. They do not cast spells to cause evil or to befall others. They believe that causing evil will bring evil back to the one who causes it. Their religion is based on nature, and is founded on the belief that the whole world is interrelated, that everyone is responsible for their own actions, and that peace, love, and tolerance for everyone should be encouraged everywhere. 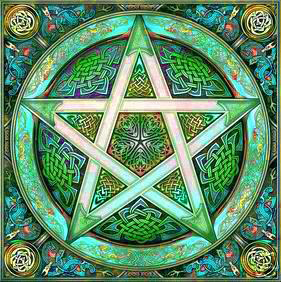 Pentagrams are used today as a symbol of faith by many Wiccans and neopagans, akin to the use of the cross by Christians and the Star of David by Jews. Christians once more commonly used the pentagram to represent the five wounds of Jesus. The pentagram has associations with Freemasonry and is also utilized by other belief systems. This entry was posted in Uncategorized on February 25, 2012 by Andrea.